The kitchen may be the heart of the home, but it can also be the workhorse of the house. Breakfast, lunch, dinner, and maybe a midnight snack all get prepared in the kitchen. Having a party? Guests will make more than one trip to the kitchen looking for a snack or two. And what is the spine kitchen? When bringing the groceries in from the car, where do you put them? Where do you prepare the food? Or even present the food? Where do the big pots and pans go after a thorough cleaning? The kitchen countertop. Kitchen countertop materials need to look good, be functional, and withstand the day-to-day hustle and bustle kitchens are known for. Fortunately, there are several styles to choose in a variety of designs. With so many options, a final decision can get bogged down by shiny surfaces, glamorous looks, and workmanlike toughness. But, that’s the fun part, right? Near the top of the list when it comes to cost, but you’ll get what you pay for in the looks department. The beauty of granite and the wide variety of colors and designs really make these countertops stand out. Marble countertops can also withstand the heat of the kitchen with nary a problem, so you veer have to worry about where to set down that hot pot or pan. However, marble is porous, and unless it is sealed every few years, stains can be a problem. Chips, nicks, and scratches can also mar the surface. Also spendy, the granite kitchen countertop material approaches the beauty of marble with the same heat durability. 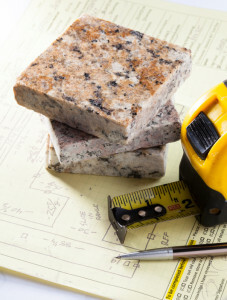 An advantage of granite, however, is the durability. A sturdy surface, granite eliminates the worry of nicks or scratches, but can dull kitchen knives if use as a cutting surface. As always, proper treatment and sealant of granite is a must to help repel stains. With pigmenting and staining options, concrete countertops offer almost any design you can think of. Some homeowners even embed glass, tile, stone, or even shells to enhance the look. A tough surface to be sure, concrete stands up to the normal were and tear of the kitchen. But, along with the price, the need to reseal these kitchen countertop materials every few years can be a deterrent. A manufactured product, quartz can be made with a wide range of colors and often radiates a rich appearance. Quartz has all the durability of marble or granite, but won’t be as apt to nick or chip and repels stains with the best of them. Quartz can be costly and is not as heat resistant as other surfaces. Some homeowners looking for a more tradition style will shy away from the look of quartz. The warmth of wood is matched by no other building product and can be incorporated into almost any design style. With several types of wood to choose from, as well as many shades of stains and finishes, wood kitchen countertop materials can give you the look you want. Reclaimed wood is even an option, making it a perfect green option for your kitchen. It’s also cheaper than the above materials. Proper care is required of course, but a proper initial treatment can last 10 or more years if the surface is properly maintained. Wood is obviously softer than concrete, marble, and granite, so nicks and dents could be a problem. If you want an industrial look, or crave a shiny modern look, go no further than stainless steel kitchen countertop materials. Durable to a fault, stainless steel worries not about stains, nor does it need the constant upkeep of other materials. When a scratch does occur – and it will – it can actually enhance the look and feel of the countertop. All the things that make stainless steel appeal to many can also turn some people off. A sleek appearance to one can seem too cold to another. If fingerprints and smudges make you queasy, steel is not for you – unless you don’t mind constantly wiping down your countertops. Other surfaces, such as tile or laminate, will be quite a bit cheaper than the above countertops. Grout lines with the tiles can be a pain to keep clean and laminate just doesn’t have the “wow” factor of the other surfaces. But both are durable and can last a long time. Whatever your home remodeling needs, Designers Northwest has over 30 years of experience in the Vancouver area, with the skills, resources and technical knowledge necessary to complete every remodeling project to exceed your expectations.